GoY Winter Wellie Olympics Closing Ceremony. 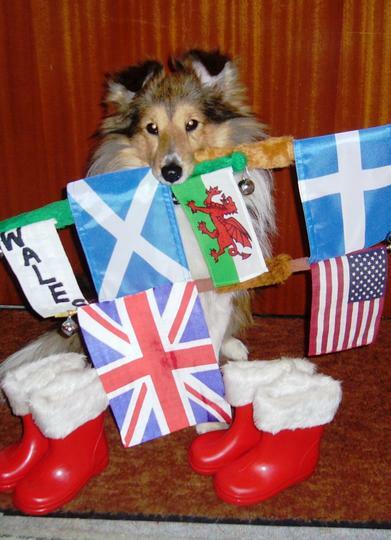 Pleased to report Conker felt fit enough to carry the flags for the GoY Winter Wellie Olympics pets in the closing ceremony. Here he is, caught in the flashlight, holding as many of the different nation's flags as he could manage. Lol. It's nice to see you looking so wonderful. Conker is holding on tight to the Welsh flag ! Lol. ...and maybe a tiny pair of wellies in the corner..Lol. ...but I try to let current pets 'inherit' toys and trick items wherever possible. Well done Conker, you're looking really good! Didn't realise the closing ceremony was today. Felix has been missing since last night- he must have gone to collect all his medals on his own, I'm a bit miffed as I did want to be there :~(((((. I don't think I see an Australian flag there TT???:~))))))). Conker is getting more perky, isn't he. Thanks. I used to groom Conker twice a week, but he hasn't needed a brush near him for months.. I have a feeling those FFP didn't do very well..LOL. Over the past year I've had to learn a lot about coping with a pet suffering from cancer..
she'll tell you all about it..LOL. but Crocus offers to moult more feathers as filling...Lol. Thanks... Conker is playing, and eating... and trying to grow lots more hair on his body... about another five inches in length to grow on some parts ! Lol. Great to see Conker doing his bit. Lets hope the weather soon bucks up and he can get that beautiful coat back. My Conker how handsome you look, carrying the GoY family flags with such pride. It’s good to see you looking so well keep well Kipper the black cat =^..^= will keep wagging for good health. Thanks Bob, Uma, Pansypotter, Neellan and Sue and Kipper..
All winter, Conker has been wearing knitted coats. Hurrah!!! Bless Him , he is wonderful. Well done Conker and glad you are feeling well at the moment. Conkers says thank you everyone.. He loves carrying the flags of so many countries. He does like to be busy helping and carrying ! Hopefully in a few weeks it will be warm enough for Conker to be out all day:~))). You have very clever dogs, Terra. Keep fighting those gremlin cells, Conker! I've passed on your messages to Conker ! What a beautiful dog you are Conker & very clever - keep fighting those gremlins. Conker no longer needs to wear knitted coats in the daytime now. So glad Conker is feeling and looking better! This is such a cute photo! I love it! ... fetching, retrieving toys etc..
That's wonderful he's perky and feeling great again! I missed the closing ceremony on welivision so am double glad to see this photo. Thanks, Terra. Been out of touch for a few days as my computer had a week of 'down time'. Welivision...? Wellievision.. ? ...good one.. :o) Lol. I'm glad to know your absence was caused merely your computer having a rest, and nothing worse. What a soul-inspring salute! Glad to hear Conker was feeling well enough to carry those flags - Great photo and sentiment! Thanks for sharing. Fantastic photo of Conker with all those flags! I have put it into my favourites! It so good to see him taking an active interest in things once again & I was so pleased to hear that he has grown new hair! :-) looking forward to seeing more photos & hearing a lot more about his improvement in health. How are your fuchsias ? Getting ready for the usual superb display on your balcony...? Thanks. Conker enjoyed some sunshine today. The time in the garden made him rather tired, but he seems to get stronger each day .. Yes, Conker is growing fur, and it makes him look rather like an eight month old puppy... sort of half length hair ! It was a brilliant day yesterday with sunshine from sunrise to sunset! I took advantage of the sunshine to take more photos of my Crocuses on the balcony railing. I eventually put a few into my blog which had been waiting termination for at least a week, maybe even 10 days! I would have liked to put all 9 pots of flowers on there but I thought it might be a bit too much of a good thing. I'm so glad for you both that Conker is looking so much better. His new hair looks lovely & soon it will be as long as it was before. I found your blog and pics. Lovely pretty Crocus colours. So pleased to hear Conker is improving. He is a beauty. ! Alf and Dolly send lots of purrs. Can't find this on your blog list TT, have you deleted it? Are you looking for my GoY Winter Wellie Olympics blog called "Are You Ready" ? Let me know if that's what you're trying to find. No it's not that one TT. Karensusan was asking if you had done a blog on Goy winter olympics and I told her to look in your blog list for 'are you ready' which I found, but I couldn't find the 'closing ceremony' (which is this one) I found it by looking back at my outbox comments. This blog doesn't seem to be in your list of blogs? This was uploaded as a photo I think Skillen ,rather than a blog.Am I correct TT ? Hi again Skillen... That's right Aster.. The comments towards the end of "Are You Ready" list the final medals tables for our GoY Winter Wellie Olympics pets..Lol. UBC Botanical Garden, Vancouver, Canada. 10 Jan. 2009. GoY Welliepedia. 2 October 2009. Vancouver 2010. Another look at the UBC Botanical Garden. Are You Ready ? 10th Feb. 2010.